Grab Our Last Minute Xmas Goodies! I know we say it every year… but we can’t believe Christmas is only a week away! With some of our best deals on menswear going fast, and next day delivery ending on the 22nd for Xmas Eve arrival, we suggest you get in there quick! Tootal scarves are a legendary British brand with serious Mod heritage. Their basic style hasn’t changed — high quality silk scarves with memorable patterns. We’re proud to stock three mini pin dot Tootal scarves in Black, Parka Green and French Blue. A great little stocking filler. Like their standard twin tipped polos, this Fred Perry zip neck polo shirt boasts a 100% Pique cotton fabric that will keep you cool and comfortable. The addition of a zip put this polo in a category of its own, making it a unique addition to any casual wardrobe. Available now in Iris Leaf and Navy from Medium to Extra Large. Check out these Farah quarter-zip sweatshirts in three marl colours — True Navy, Black and Light Grey. Made from soft 100% loopback cotton, these sweatshirts have sold incredibly well this year as 1/4 zip styles make a deserved comeback. Available now in sizes Small to Extra Large. This iconic Lyle and Scott jacket was one of our best selling pieces of outerwear last year. Despite the light weight, it’s a true winter jacket built for warmth and comfort. Elasticated cuffs and hem retain heat, and the drawstring hood protects you from the wind and rain. Available in Black, Dark Navy and Woodland Green in a wide size range from Small to XXL. Lacoste is among the most sought after brands for men’s underwear. These iconic boxer trunks are made with a supremely comfortable cotton stretch fabric in a classic slim fit. We stock a 3-pack boasting three shades of blue: Navy, Sky and Royal (left) and another 3-pack in Black, White and Grey (right). Browse our complete range of Lacoste underwear in more colours here. The Thommer and Sleenker slim-skinny jeans have quickly built up a big following among our loyal Diesel fans. The skinny fit will make legs appear a little longer and slimmer than a regular tapered jean, but without being too tight against the skin. Choose from a variety of washes and sizes here. Some garments just hit you right away with their bold, brilliant design and eye-catching patterns, and Jiggler Lord Berlue shirts are a case in point. 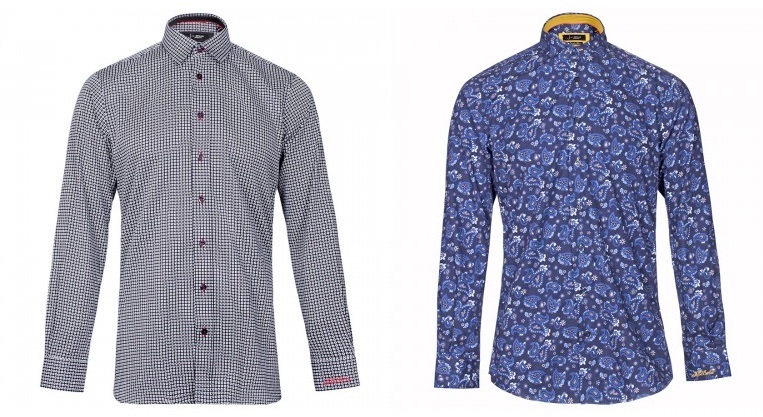 Whether you prefer the black-and-white retro print Puck shirt (left) or the bold modern Paisley patters of Leone (right), you’ll be getting style and quality in equal measure. If you spend over £100 we’ll give you FREE next day delivery! The latest you can order is Dec 22nd if you want your package by Christmas Eve. Unfortunately, the deadline for standard Royal Mail postage has already passed — but everything online is also available in our Horsham shop!